Duke's Muslim Students Pray Amid Controversy Over Call To Prayer : The Two-Way They will gather for their call to prayer in the quadrangle outside Duke Chapel, a day after Duke University reversed course on allowing the traditional call to prayer from the chapel's bell tower. 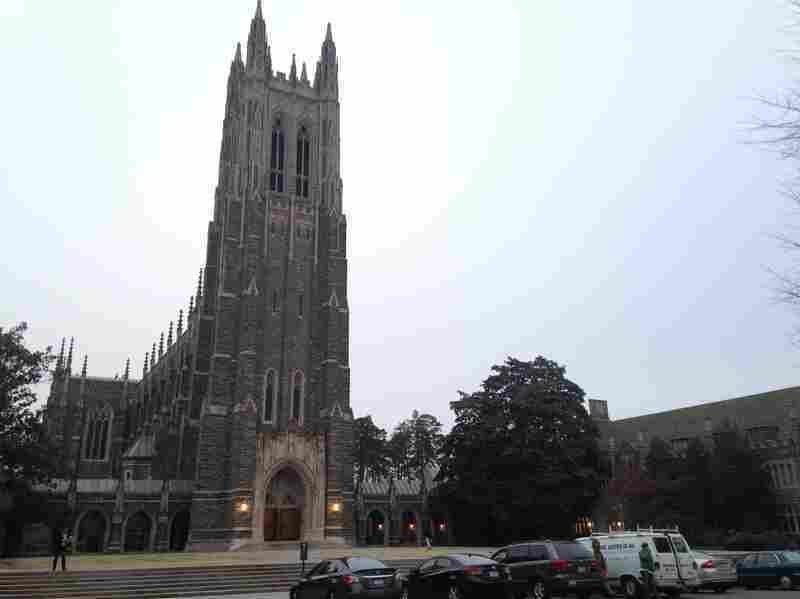 Duke University's Muslims students will issue their call to prayer today outside the Duke Chapel in Durham, N.C. On Thursday, the university reversed course on allowing the traditional adhan from the chapel's bell tower. Muslim students at Duke University gathered today for their call to prayer in the quadrangle outside Duke Chapel, a day after the private university in Durham, N.C., reversed course on allowing the traditional adhan from the chapel's bell tower. The call to prayer occurred over a public address system outside the chapel. The Los Angeles Times reports: "As several hundred students, campus police and a huge press contingent looked on, Imam Adeel Zeb, the university's Muslim chaplain, took up the microphone." "We are so grateful to everyone who has shown support," he said. "The event lasted perhaps 15 minutes. Members of the Muslim Students Assn. headed for the chapel basement, where they have met for regular Friday prayers for two years. That event was closed to media and the public for security concerns." As we reported Thursday, Duke's about-face came after angry reaction from some Christian groups. CBS affiliate WRAL cited a "credible and serious security threat" as the primary reason for the reversal. The original decision, announced this week, would have let members of the Muslim students Association read a moderately amplified call to prayer from the Duke Chapel bell tower for about 3 minutes each Friday. More than 700 of the university's 15,000 undergraduate and graduate students identify as Muslim. The controversy over the call to prayer was not what the private university, which was founded by Methodists and Quakers, intended. The original decision to allow the prayer was described by Christy Lohr Sapp, the associate dean for religious life at Duke University Chapel, as "a larger commitment to religious pluralism that is at the heart of Duke's mission." Many Christian groups as well as evangelist Franklin Graham, the son of the Rev. Billy Graham, excoriated the decision. And the university received complaints by phone and via email. Richard B. Hays, the dean of the Duke Divinity School, in a letter said he had heard of the decision to allow the call to prayer only through the public announcement. He called it "ill-advised" and said he was "glad to learn of the University's subsequent decision to cancel this plan." The Divinity School and the Duke Chapel are administratively distinct entities at the university. Duke Chapel is associated with the United Methodist Church and its motto, Eruditio et Religio, means Knowledge and Religion. The Rev. Luke Powery, dean of the Duke Chapel, told NPR's Here & Now, that while some people "align a kind of radical expression of Islam with all Muslims, and I think what we have to say is we cannot essentialize any particular religious group or racial group, because we are much more complicated than that as human beings." Powery said other religious groups on campus, including Hindus, Buddhists and other Christian groups, use the chapel building for various prayers and worship services. But in the end, Duke reversed course, saying "what was conceived as an effort to unify was not having the intended effect." "'We're all very upset right now,' said Daniel Ray, 24, in his third year of the divinity master's degree program. "The issue has been a topic of conversation at the divinity school. "'We were talking about it today in my Christian ethics class,' said Indhira Udofia, 26, who is in her third year pursuing master's degrees in divinity and social work. 'Most were siding with the Muslim students,' she said."